Last week was the kickoff of the annual Wild & Woolly sale, and this time I went prepared. I made a list ahead of time so that I wouldn't come home with WTF? yarn, and I would come home with yarn that matched my knitting plans. At the head of the list: scarf yarn. Remember the fabulous variegated, sparkly, large gauge Gedifra Byzanz I picked up in Madrid? I've swatched, knit and ripped this yarn so many times I've nearly lost count. I know that I want to make a scarf out of it, but when I knit it at its proscribed gauge I just don't have enough yardage to make one. My current plan is to use some coordinating yarn to either stripe, hold together, or some combination therein. At Wild & Woolly, I found some baby blue Zarella that matched the lighter sections of the variegattion perfectly. Excited to finally be making this scarf, I put aside Jason's cardigan and cast on. The verdict? Don't like it. While the baby blue matches parts of the yarn perfectly, it's far too light when held next to the rest of the colorway. 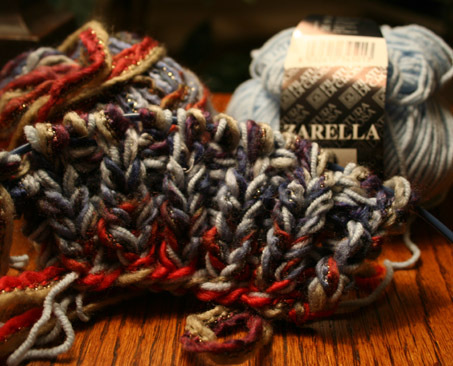 The longer I knit with them together, the more the baby blue started to look white next to the deep jeweltones of the Byzanz. 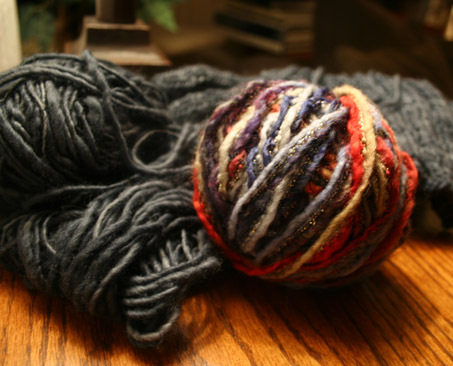 I ripped out the few rows I'd done, rewound the Byzanz into a ball, and set it aside. Looks like I'll be in the market for some darker yarn to make this scarf with. Turns out the answer was right in front of me. Keep your fingers crossed that I'll have enough Manos left over to finally make myself this scarf! Isn't it funny that the answer was right there in front of you all along? Nice color in the Manos! I work at a LYS, and they always send us the manos is those huge bales. That's how we display them!